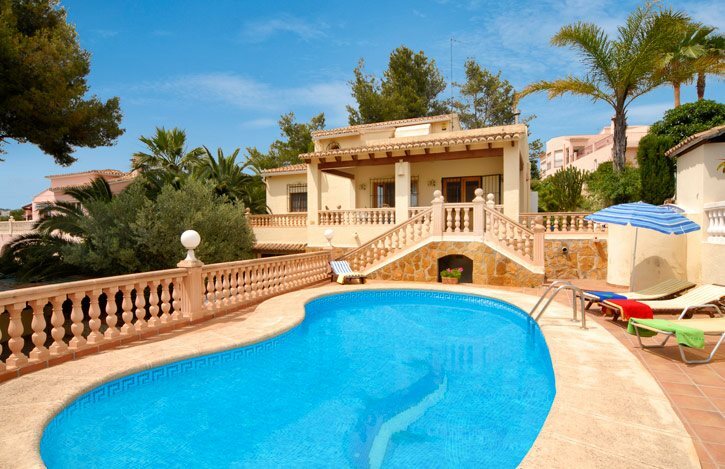 Villa Mar China is in a fantastic central location within walking distance to the town of Moraira, where there are plenty of shops, bars and restaurants to enjoy. The closest beach is Moraira, which is just 10 minutes away on foot. This 4 bedroom villa has a private pool and raised dining terrace where you can enjoy alfresco meals. Pool heating, WiFi and air conditioning/heating in the bedrooms are included. The location is simply great, you'll be within 10 minutes' walk from the centre of Moraira. Ideal! There are 8 steps from the front covered terrace down to the inviting pool and terrace area where you can relax on one of the sun loungers with a cool drink. At the rear of the property is a large casita with built-in BBQ and bar, ideal for outside dining on the wooden table and chairs opposite. There's a second table and chairs on the raised terrace. Entry to this villa is via a sliding metal gate which leads to plenty of off-road parking. From the drive there are 21 steps up to the covered terrace and main entrance, which opens into the lounge/dining area. The open plan lounge/dining area has a home from home feel and is furnished with comfortable seating, a flat screen TV and a dining table and chairs for entertaining your party. Adjacent, there's a fully equipped kitchen, which has a small table and chairs where you can enjoy a continental breakfast. On the ground floor there's 3 twin bedrooms, which share a separate bathroom. The double bedroom with en suite bathroom commands the entire first floor. It has patio doors out to a large private terrace with distant sea views. All bedrooms have fitted wardrobes with plenty of storage space. This villa is registered and licenced by the Generalitat Valenciana to comply with local legislation on holiday rentals. This number is: AT-436088-A. This villa is located within 10 minutes' walk of the centre of Moraira with its sandy beach, restaurants, bars and boutique shops. The marina is at the end of the high street, a special place to sit and dine, whilst overlooking the boats. In the summer fiestas are held with costumes, battles and spectacular fireworks. If you fancy a day out the resorts of Javea and Calpe are both within 20 minutes' drive. To stock up on those holiday supplies the supermarket is just 10 minutes' walk from Villa Mar China. There is a weekly market in the centre of Moraira every Friday morning, offering everything from fruit and vegetables to handbags, clothes, toys and more. The centre of the village has plenty of shops to browse. In the heart of Moraira you'll find a great variety of cuisine, bars and a small nightclub which is partially open air. One of the most up market restaurants on the Costa Blanca sits just above El Portet Beach in Moraira. Moraira Beach is just 10 minutes' walk from the villa with an excellent range of facilities including beach games, restaurants, ample parking and a watch tower from which to admire the amazing views. Alternatively, L'Ampollo Beach is a sandy bay with life guards in summer and a beach cafe. There are many coves and smaller beaches in Moraira, with El Portet offering a sandy but small beach with cafes and restaurants behind. It's considered an exclusive area and many boats and yachts come to drop anchor in the aqua marine coloured waters, so a great place to people watch too. Moraira has lots to offer including banana boat rides, jet ski tours, go-karting, paddle tennis, golf, paddle boarding and even a small fair for the younger children. If you fancy a day out in Benidorm, its only 45 minutes' drive away with plenty of attractions like to the Terra Mitica theme park and waterparks. If you want to stay close to home, try a day out in Calpe, famous for its rock and fresh fish. Further afield, a day out in Valencia or Alicante is fun from both a historic point of view and modern living. Valencia also has the Science Centre which proves popular. There is a full golf course in San Jaime, Moraira, or drive to the Javea Club de Golf and the Marriott Golf Hotel, on the way to Denia. Walking and climbing of the Penon de Ifach Rock is very popular and there are several levels of difficulty. Villa Mar China is not available to book for season as it is sold out. Take a look here at the Costa Blanca villas that are currently on sale. Customer Villa Comments: Great location, but loads of steps. Pool was good, table tennis and pool tables were good and got loads of use. The Veranda area was really nice and great place for drinks in the evening. The location of the villa was great, with everything that you need. Great family villa. Ideally located for a short walk to moraira and for exploring the surrounding area. The whole family enjoyed the villa holiday and we would definitely do it again.